Booty (dressed in coat with necktie) is served with traditional Sabah food by sisters Suzaini Sabdin Ghani, 44, (third right) and Sabrina, 40, (fourth right) as well as their mother, Nora Sabdin (wearing green headscarf) of Sri Pinang Restaurant at the state-level Raya Open House celebration yesterday. KOTA KINABALU: Mike Booty has been to the country for about half a dozen times, but never had he experienced a large-scale Hari Raya celebration such as the one held at the Likas Sports Complex here yesterday. Booty from the United Kingdom was even more captivated by the large turn-up of people coming from different religion, race and background. 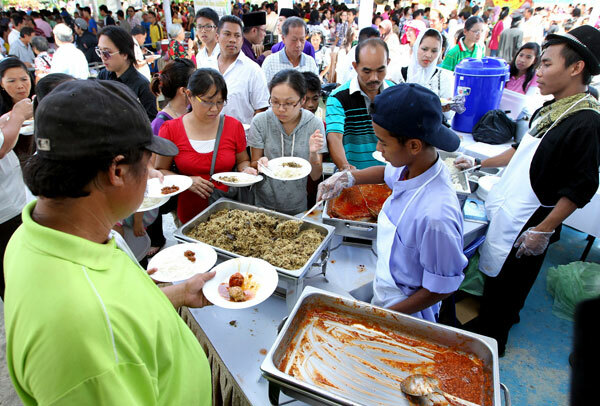 More than 30,000 people attended the state-level Raya Open House at the Likas Sports Complex yesterday. “This is like the Garden Party hosted by Queen Elizabeth II at the Buckingham Palace. But this is larger. 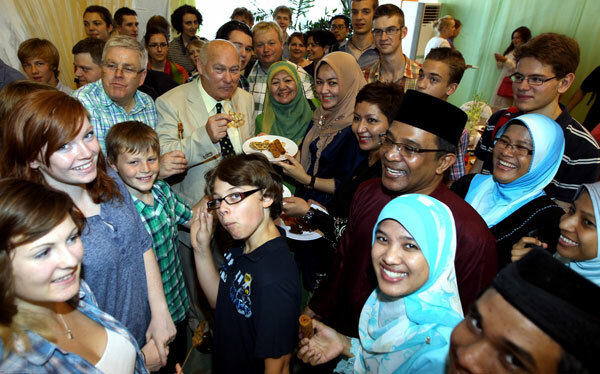 Back home, the Queen’s party would be by invitation only, which I have attended myself but this is bigger … everybody is welcomed to attend and enjoy the various food served,” he said, when met at the state-level Raya Open House 2012 here. Chief Minister Datuk Seri Musa Aman speaking to foreign visitors at the open house. The South Norfolk Youth Symphonic Band’s musical director and chairman led 65 musicians to the do after being informed by Rotary Club of Kota Kinabalu president Iskandar Ahmad. Booty said the band is in town for concerts at Kian Kok High School in Likas on Monday, where they also conducted a music workshop for about 300 students from nine schools, and at 1Borneo Hypermall Centre Atrium today (August 21) from 7pm to 9.30pm. 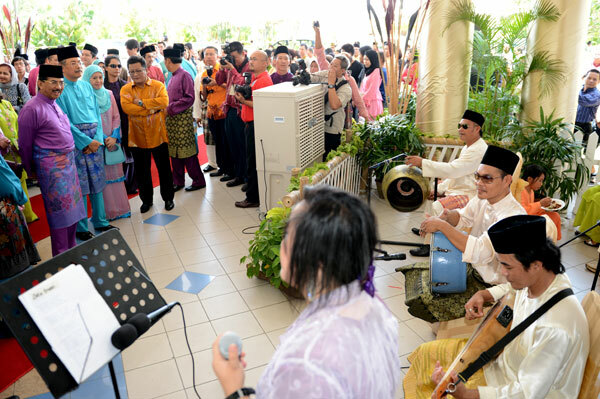 Head of State Tun Juhar Mahiruddin and Chief Minister Datuk Seri Musa Aman watching a musical performance at the open house. “I have attended open houses before but those were at friends’ houses … I never realised that this festivity is also celebrated at such a big scale,” said Booty. Despite trying out Sabah cuisines such as ‘kuih sapit’, ‘kuih jala’ and ‘kuih cincin’, he seemed happy after getting hold of his favourite dish – the beef ‘rendang’. The Chief Minister and wife presenting green packets to the senior citizens at the open house. Booty was among the 30,000 people who attended the event. Chief Minister Datuk Seri Musa Aman and wife Datin Seri Faridah Tussin, accompanied by other cabinet ministers and their spouses, were at the entrance greeting the public who came as early as 9am. “I am happy with the encouraging response from the people, especially when those who came comprised both Muslims and non-Muslims who joined in the celebration. This is indeed a true reflection of our ties in Sabah, enabling us to live in peace and harmony,” said Musa. He is optimistic that such ties would continue, creating a comfortable place for all to live in. “I would like to thank those who spared their time to attend today’s (yesterday) event, and joining us in celebrating Hari Raya Aidilfitri,” he said. 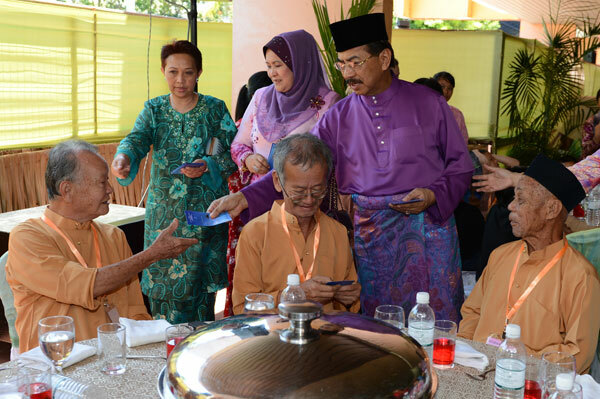 At the event, Musa also presented Raya packets to orphans and people with disabilities from various welfare homes. Also present were Head of State Tun Juhar Mahiruddin and wife, Toh Puan Norlidah Datuk R M Jasni.